As Galactica continues to deteriorate, so does the morale of the crew — both human and Cylon alike. In the Admiral's Quarters, Saul, Ellen, Kara and Lee debate on whether or not they'll begin a search mission to find Hera, who's considered to be the key to both Human and Cylon survival. Then, tragedy strikes when a hole in Galactica's hull kills 61 crewmembers — 26 of which were Cylons. One of the engineers informs the Admiral that Galactica has an estimate of five jumps left and a 90% chance of being ripped to sheds in the process. The Admiral is torn between abandoning the ship, and ensuring the safety of the fleet. Meanwhile Lee faces the enraged ship captains who have no regards for the Commander's dilemma, but instead insist that the demands of each of their respective ships be met. As a dying wish, an Eight critically wounded during the tragedy in the hull, asks for Saul Tigh to come to her bedside. He does so reluctantly and she thanks him for the opportunity to finally meet her father. Confused by her last words, Saul is convinced that lunacy has taken over the ship. But later on in his quarters, Ellen assures him that he's had millions of children and to ensure their survival, Hera must be found, as she is the last link they may have to the future. Still struggling to figure out her what her own future entails, Kara Thrace meets Baltar in the bathroom and questions whether or not he truly believes in angels. As a walking dead woman with vengeance in mind— she gives him the dog tags that she pulled off her dead body on Earth, and challenges him to find answers to the many questions that lie at hand about who she really is. She then goes to visit Sam Anders who has been hooked into the main power grid of the ship as a last attempt to save his life. Yet unable to see him suffer any longer Kara orders the Eight who has been caring for him to go away, as she plans to shoot him to end both his and her own suffering. Yet with a startling jolt, he regains consciousness, grabs her arm, forcing her to drop the gun and begins speaking nonsensically about events that have passed and those that will come. But the most eerie statement is his affirmation that Kara Thrace is the harbinger of death. When the others realize that Sam Anders being plugged into the main power grid was the cause of the ships' random power surges, temperature fluctuations, Saul Tigh orders him to be disconnected, for greater fear that Sam may inadvertently jump the ship in its fragile state. 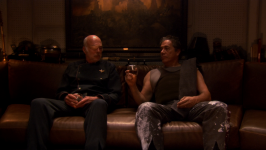 While visiting Laura Roslin in sick bay, Bill Adama faces the reality of his own need to disconnect. Although it is the only home he's ever truly known, Roslin warns Adama that if he does not make the right decision and ensure the safety of those aboard Galactica, he might risk losing both her and the ship, the two great loves of his life. Later on, as Adama heads to the funeral of the lost members who were killed in the hull accident, a heartbroken Helo begs Adama to allow him to take a raptor so that he can go searching for his daughter. But Adama informs him of the bleak news that they had already gone to search for her but to no avail. They found that Cavil had already moved the Colony taking both Boomer and Hera with him. At the most inopportune of times, Baltar exclaims to the somber funeral crowd that hope is not completely gone. He holds up the dog tags given to him earlier by Kara and informs everyone that the DNA on the tags were in fact from her dead body. Thereby making Kara Thrace a walking angel, in his opinion. Yet his epiphany of walking deities was ill received— Kara slaps him and the Admiral threatens to have him thrown in the brig. Baltar faces the realization that the funeral was not only for the fallen members of the fleet, but also for the hope they once had in destinies. Also saying goodbye to her own dreams, Boomer projects with Hera back to the home she thought she would share with Galen on Picon had the Cylon and Human war not taken place. She leads Hera up to the room she thought would be her daughters'. Completing her mission, she then takes Hera back to Cavil who relishes that they were able to deceive Ellen into thinking that Boomer helped her escape to Galactica out of genuine concern. Yet while Cavil is pleased, Boomer takes a last regretful look at Hera who cries out for her. - The title of this episode is based on the book "The Outermost House" by Henry Beston. In the book there's a plot involving a character being stranded on a remote island. One line of the book reads, "For a moment of night we have a glimpse of ourselves and of our world islanded in its stream of stars— pilgrims of mortality, voyaging between horizons across eternal seas of space and time." - Tyrol's conspicuous disappearance in this episode was due to his having been incarcerated for helping Boomer. The scene explaining this was cut. There is an extended version of this episode which includes these scenes, among others. Though I must warn you, the extended version of this episode has even more pacing issues than this one did. - The Galactica's hull breaching, venting a whole bunch of people into space. - The fleet captains objecting to the Cylon baseship being the only military presence within the fleet once Galactica is destroyed. - The vultures circling around scrapping Galactica for parts. - Caprica Six to Baltar: "I have no desire to join your harem." - Caprica Six to Baltar: "You haven't changed Gaius. I have." - Boomer yelling at Hera for crying. - Saul to Ellen: "You wanna know who my people are lady? The ones on this ship. The ones I fought with and bled with. The old man, this crew, they're my family. The only family I've known and the only one I care to." - Boomer sharing her projection of the house with Hera. - Starbuck greeting Baltar while sitting on the toilet peeing. - Starbuck to Baltar: "And you've seen these angels for yourself?" Baltar: "With alarming regularity." - Starbuck confessing to Baltar that she saw her dead counterpart on Earth, giving him the corpse's dog tags. - Sam waking up and grabbing Kara's arm right when she was about to kill him. - The revelation that Sam is slowly gaining more and more control over the Galactica. - The revelation that Cavil moved the colony and that without knowing where Cavil is there's no way to rescue Hera. - Helo pleading with Adama to let him go look for his daughter. - Baltar revealing Starbuck's secret to the crowd at the funeral. - Lee consoling Kara by telling her he doesn't care what she really is. - Boomer arriving at the Cylon colony. The penultimate episode to the three part finale continues the trend of an unsatisfyingly slow plot progression. The most significant events are Baltar revealing Starbuck's secret to everyone and Adama's formal decision to abandon the Galactica as a lost cause. Unfortunately, while both plot threads are interesting and move things forward adequately, neither plot thread is executed as well as it could have been. Adama's story first centered around his outright refusal to even consider giving up on the Galactica followed by his slow, reluctant acceptance that the ship is a lost cause. The problem is, while Adama may be convinced, I am not. It's obvious that the plot wanted to use the damage done to the ship by Boomer as a catalyst to have the ship declared permanently unsalvageable. However, nothing that happens in this episode is evidence that the ship cannot be repaired. Granted, the repairs aren't going well. But there's no evidence that they are a hopeless cause. All we do get attempting to substantiate that plot is a lot of sensationalism about the ship's ever worsening state of dilapidation and the circling vultures of the other ship captains. Even Tigh chastises the deck guy who seemed to most conspicuously replace Tyrol today for no coherent reason for claiming that there's a 90% chance another jump would destroy the ship. As Tigh said, I think a decision as critical as abandoning the Galactica should be made only with 100% certainty of the ship's expired viability. Then there's the line about "sending her off in style." What the hell does that mean? Scrapping the ship and feeding it to the vultures is "sending her off in style?" I think Lee Adama sent the Pegasus off with a lot more style than that. Regardless of all that, I think the plot thread is not without merit. The Galactica was an old piece of crap from the very first episode and now it's a repeated battle torn old piece of crap. It's amazing it's lasted this long. I just wish the specifics of the plot made it clear beyond a shadow of the doubt that the ship cannot be saved. Because that's what it would take in my opinion for Adama to give up on the damn thing. Even more muddled was Baltar spilling the beans on Starbuck's secret. His angels speech was vaguely incoherent and didn't seem to get him anywhere, but it was at least interesting that the first thing this man of science did after meticulously studying the dogtag was to try to further enlarge his flock by disseminating that information in a sensationalist motivational speech. What's bothersome though is Starbuck's confession to Baltar didn't result in any advancement of the plot or answer any significant questions about Starbuck at all. Frankly, Starbuck's resurrection was fairly common knowledge anyway. Proof of the existence of a duplicate body is insignificant compared to the fact that she literally reappeared to them all from nowhere. What's worse though is that the narrative paints a very clear aesthetic of Baltar truly believing in all this religious nonsense he's spouting. His candid bathroom conversation with Starbuck leans heavily in that direction. It's obvious that Baltar's the same old Baltar, trying to win political power and stay in the celebrity spotlight. But if this man of science is really willing to finally buy head Six' claims to being an angel of god, then I'm going to be a bit disappointed. Like Adama accepting the Galactica's inevitable demise, I can accept that Baltar might make that leap of faith, but I don't think the show has earned that yet. I think Baltar would want to eliminate all rational explanations before just saying "yep, angels are everywhere!" To top it off, in addition to all the outstanding questions such as once again having no explanation for Starbuck, once again having no explanation for the head people, and only a vague impression of Cavil's motives, we once again get zero follow up on the status of and purpose for Baltar arming his followers, even though the episode has a significant Baltar plot thread this time! The finale sure is going to have a lot of loose ends to tie up. Sure, No Exit did a lot of the footwork, but the finale will have to be packed to the brim with exposition just to be an adequate finale, much less manage to be a dramatically compelling end to the story along the way.